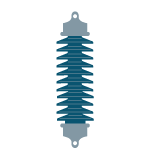 Long rod insulators are used in high voltage transmission lines and have been the popular choice across Europe since 1960. 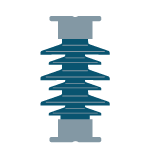 Studies reveal that porcelain long rod insulators have superior electrical and mechanical properties, power arc and interference voltage behavior compared to the traditional cap & pin type disc insulators. Porcelain long rod insulators are of solidcore type “A” construction and are absolutely puncture proof. These insulators are designed to provide a flexible support at the same time ensuring that the tensile load requirements in service are met. 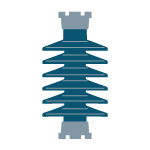 The long rod insulators are subjected to static and dynamic loads including wind load, ice load, conductor galloping, short circuit forces etc. and are designed to withstand such loads constantly and continuously for decades. The insulators are made of high quality Aluminous porcelain meeting the requirements of C130 in accordance with the IEC: 60672. Apart from the visual and dimensional checks, the long rod insulator shells are subjected to ultrasonic tests prior to assembly. Precision machines are used to cut and grind the end faces to achieve the required surface finish and chamfer of the ends. The metal caps of Spheroidal Graphite Iron are manufactured in-house eliminating the dependency on external suppliers and thereby ensure further consistency in quality and delivery. They are galvanized using Zinc of 99.95 % purity with a minimum average coating thickness not less than 85 microns (610 g/m2). The inner portion of the caps are coated with a uniform layer of bituminous paint to offset the effect of differential thermal expansion between cement and metal parts. The insulators are assembled using high quality Portland cement in specialized carousels that ensure the stringent dimensional requirements are met. They are subjected to curing under controlled conditions. These insulators are then subjected to the requisite routine & acceptance tests prior to dispatch. Further visual inspection & random dimension checks are also carried out prior to packing the insulators in wooden crates / boxes / pallets. Modern Insulators is the only manufacturer of porcelain long rod insulators in India and has supplied over a million insulators to various projects all over the world in voltages ranging from 33kV to 1200kV.